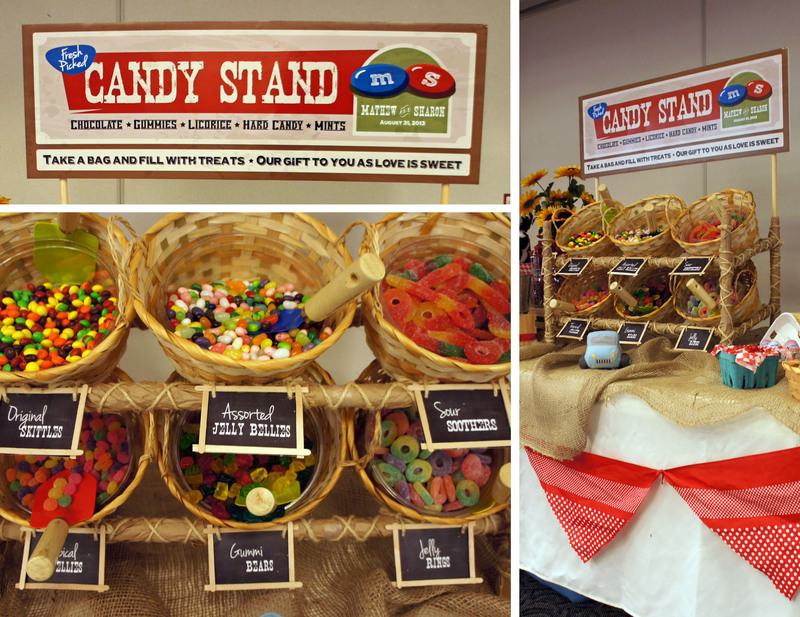 I can’t begin to tell you how excited I was when my brother in law agreed to let me take over the candy buffet for his wedding! 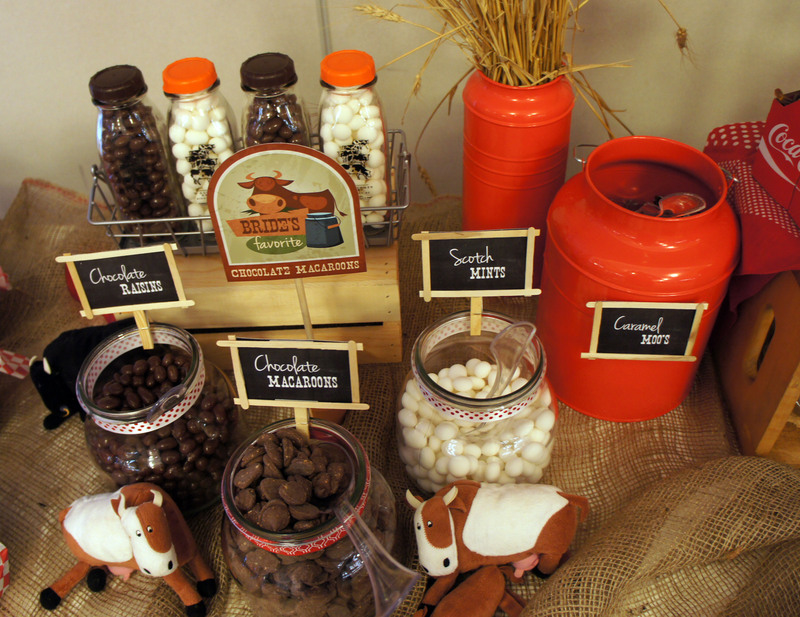 I did a small candy buffet for my son’s 3rd birthday party, but it was small peanuts compared to having to plan something for 250 wedding guests. I was happy to have a creative project this summer, and judging by the happy faces at the wedding I think it was well worth all the effort and planning. The bride and groom both grew up on farms so there was definite country vibe to their wedding. 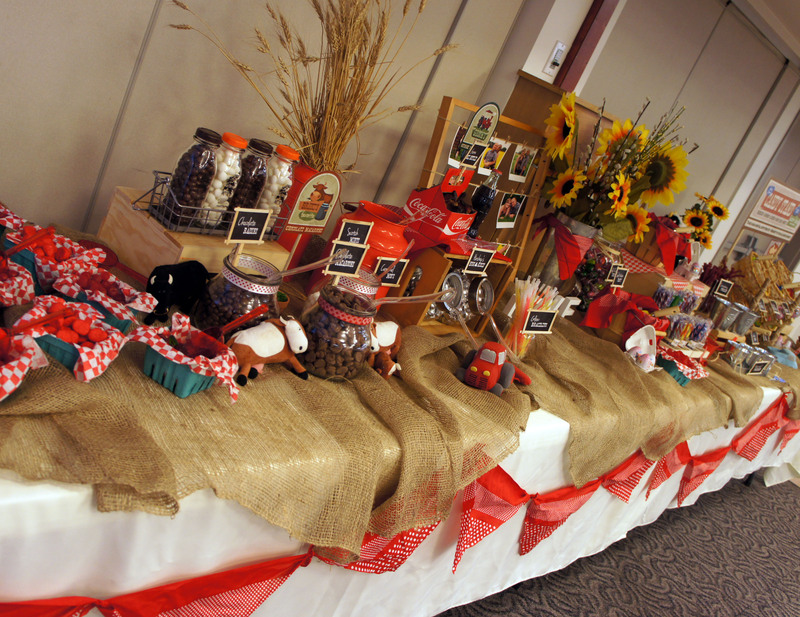 I originally toyed with doing a bright, colourful candy buffet, but decided on more of a farm stand inspiration because it seemed to suit the couple better. 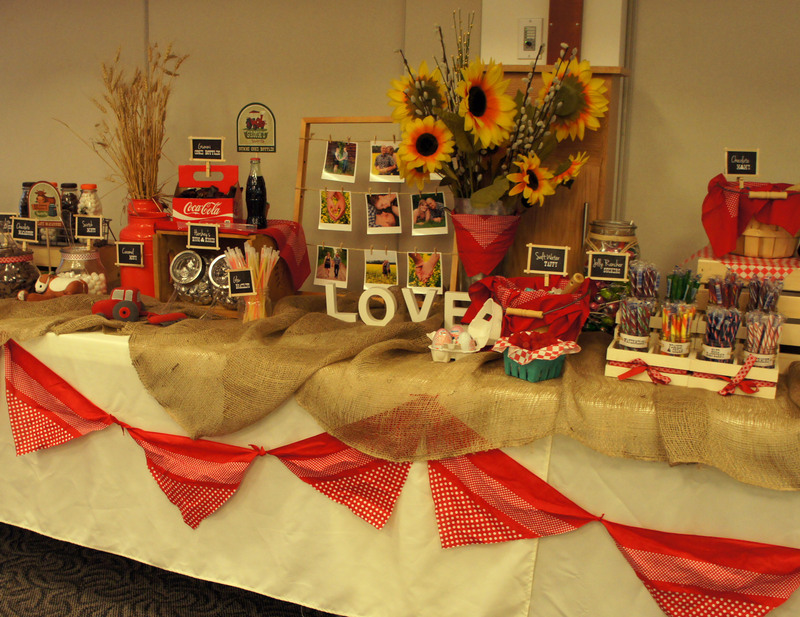 Sunflowers, bright red bandana’s, burlap and mason jars were easy décor choices and fit in with the red, black and white color scheme of the wedding. The couple had some fantastic engagement photos that were taken on the farm and I really wanted to find a way to incorporate some of them into the décor. I had a photo frame sitting in my basement so I strung some twine across, printed the photos in Polaroid format and strung them up with mini clothespins. 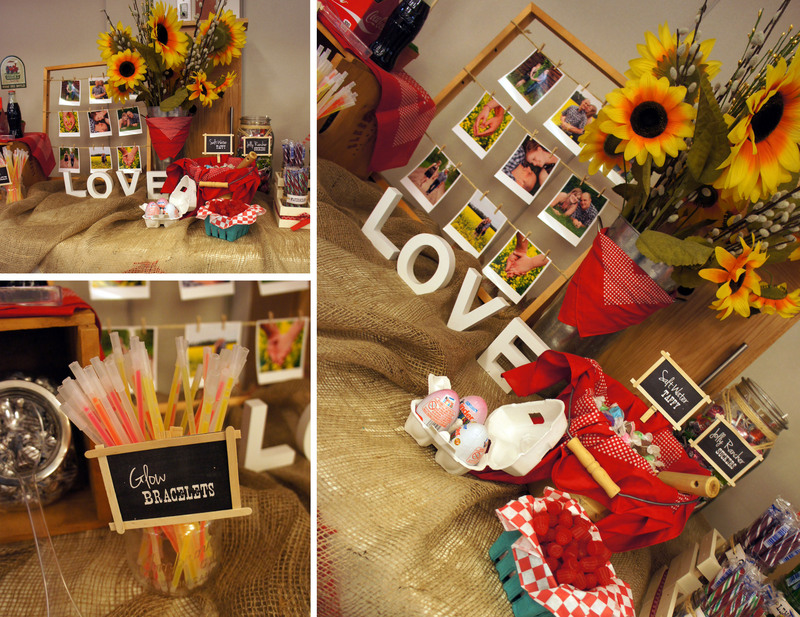 It was an inexpensive element and I love that it added a personal touch for the couple. 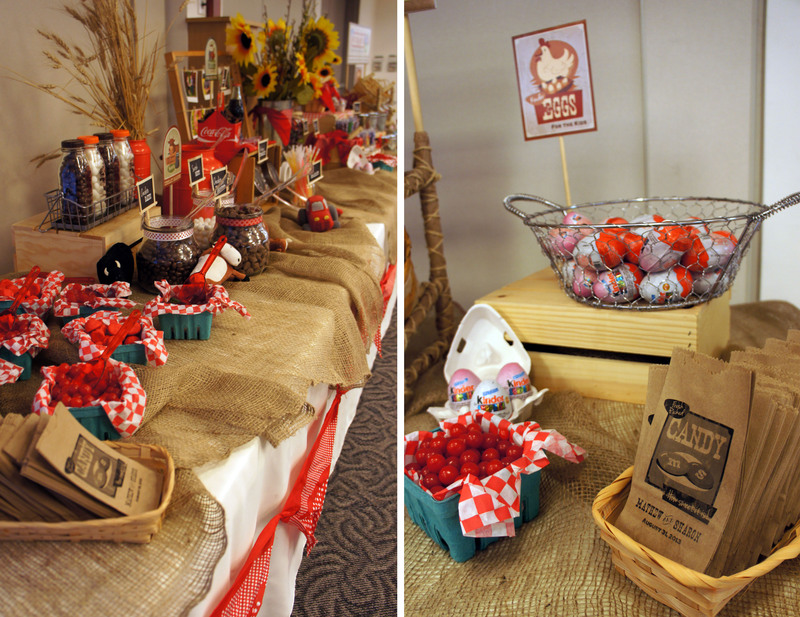 Signage for the buffet was designed and assembled by myself. 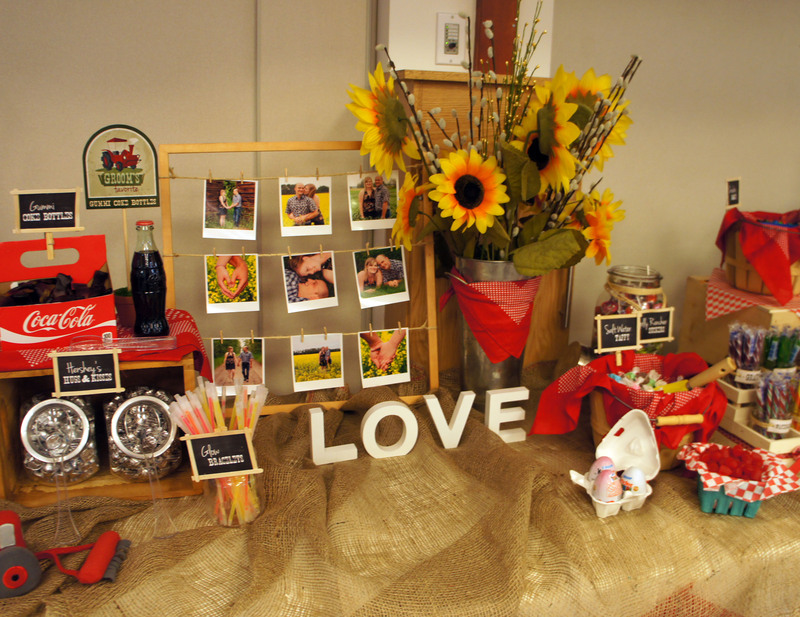 Printed elements included candy bags, chalkboard inspired candy labels, vintage style farm signs with the bride and Groom’s favorites, and a large “Candy Stand” sign. 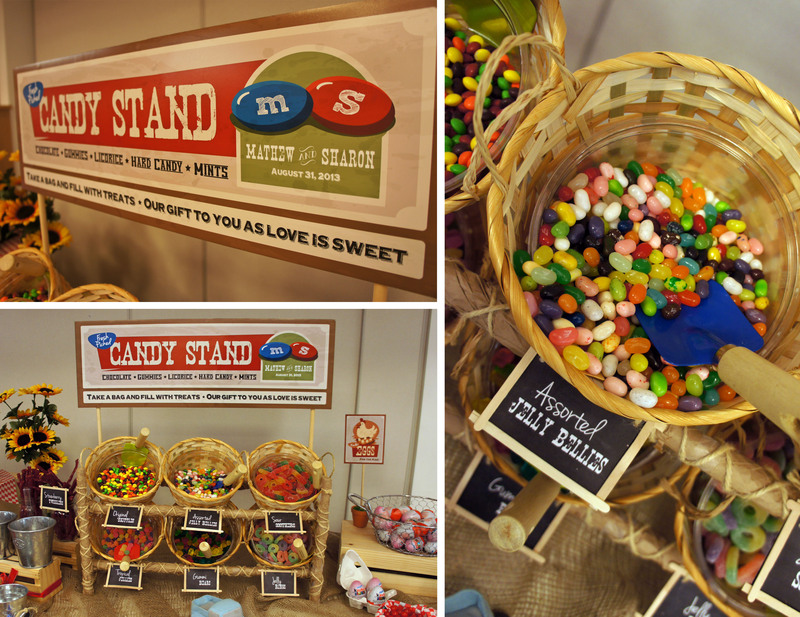 The same M&M and Skittles inspired logo was printed in black and white on small brown paper candy bags. These were a labour of love and involved a lot of cursing and paper jamming in my home printer. 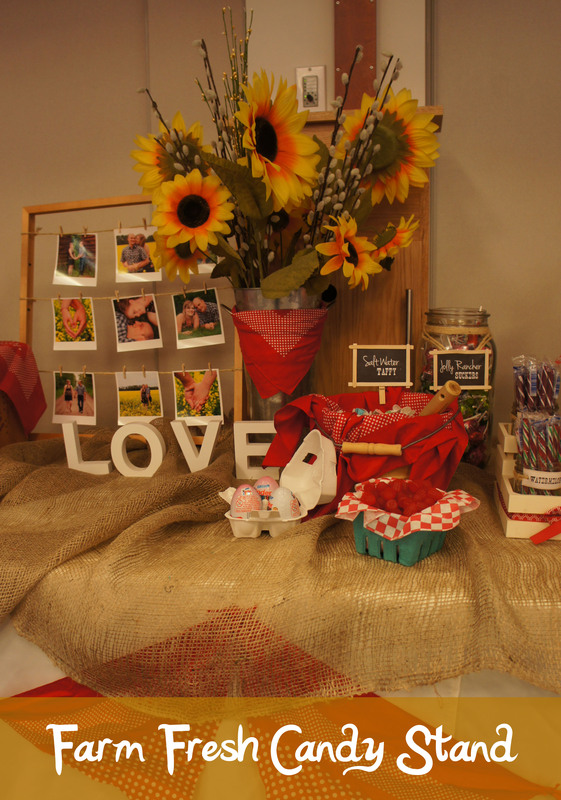 The basket stand was my big showpiece and a bit of a DIY project. I found inexpensive wicker baskets at the dollar store and was originally going to have my husband build something out of wood to hold them. I ended up coming across a metal shoe rack for $10 and wouldn’t you know, the baskets fit perfect. To make it more rustic, I simply covered the metal rods in brown paper lunch bags and twine. It is not exactly what I envisioned, but I am still very happy with the result. Another fun idea I came across in my pinterest searches was to use berry baskets to hold sweet treats. I was looking for alternative ways to display my candy besides the standard glass bowls and apothecary jars and these ended up being both cheap and unique. 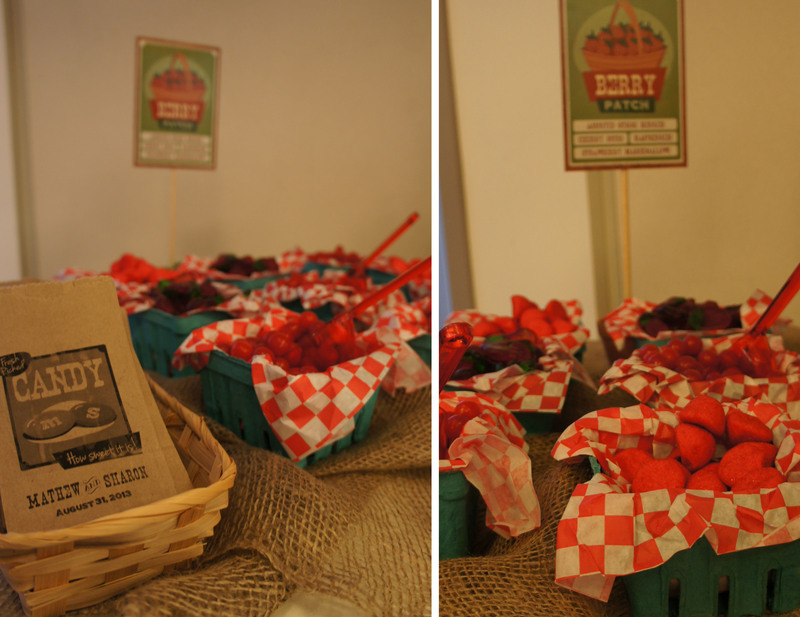 My “Berry Patch” was created by displaying various berry candy in the cardboard berry baskets. 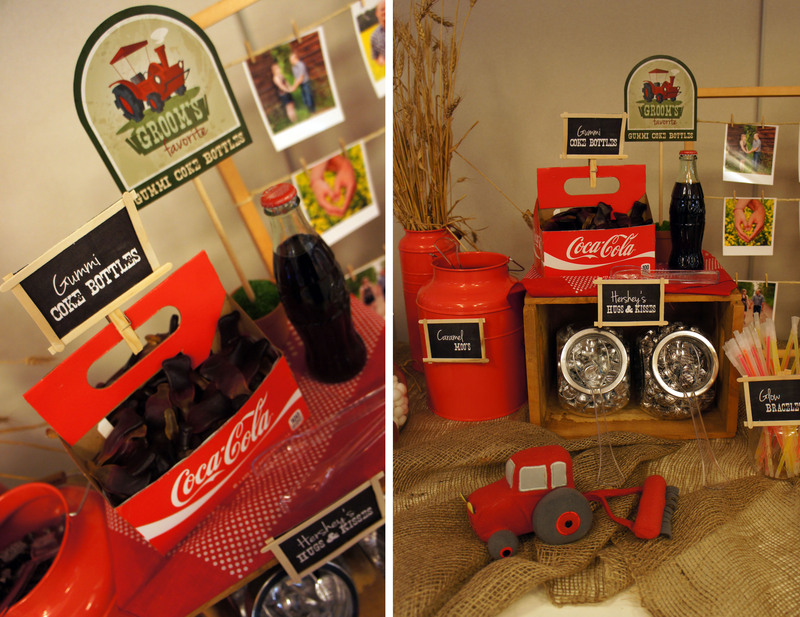 The Groom’s favourite candy was gummi coke bottles so I decided the best way to display those would be an actual Coca-Cola bottle case. I trimmed out the bottle dividers and lined it in checkered paper to make it look a bit prettier and then used a coke bottle as decoration. The bride really likes cows so I decided there needed to be a dairy section. I found old fashioned glass milk bottles and filled them with chocolate covered raisins and scotch mints to look like white and chocolate milk. 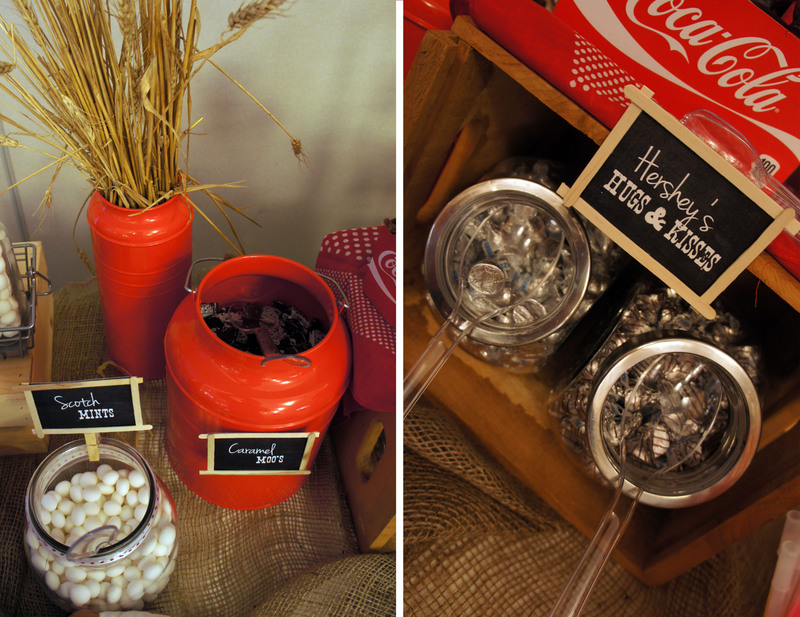 The small glass containers that held the rest of the candies and the bride’s favourite, Chocolate Macaroons, were an IKEA find. 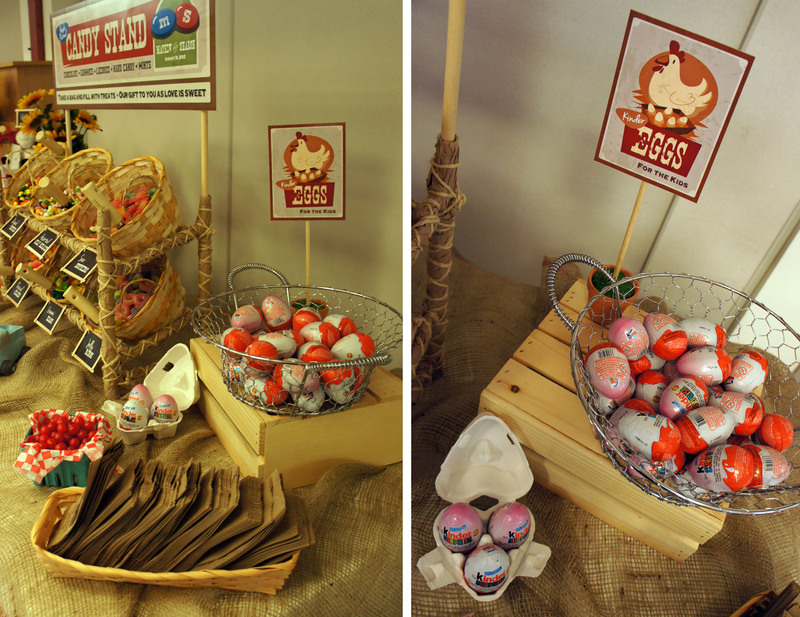 Fresh Eggs are a pretty common product at farm stands, so the natural choice was to include some Kinder Surprise eggs for the kids. I found this great egg basket at a thrift store and also set some out in egg cartons to finish the look. 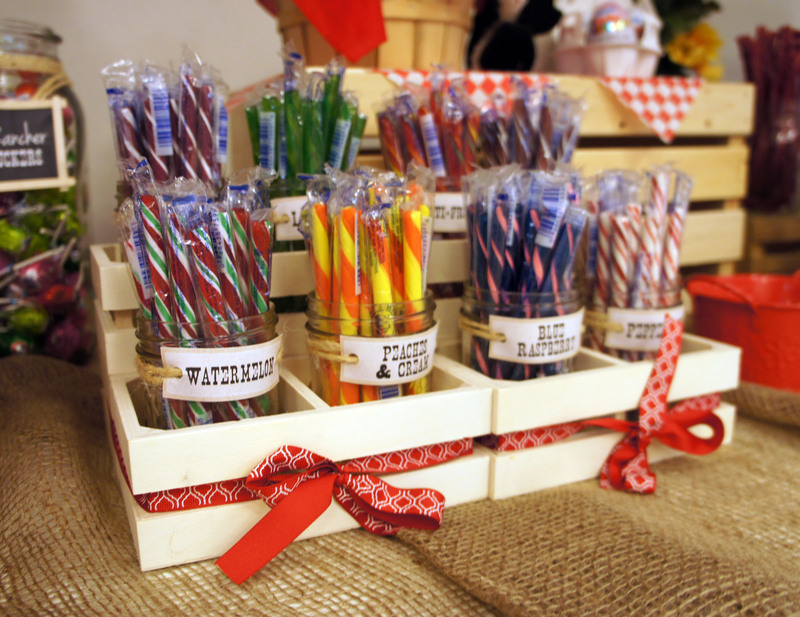 A variety of old fashioned candy sticks were set out in mason jars and displayed in small stands I made out of small dollar store crates I glued together with wood glue. The most difficult part of this project was definitely narrowing down and deciding on only 8 candy stick flavors! Once the party gets going at a wedding, I always find the reception venue to get so hot. 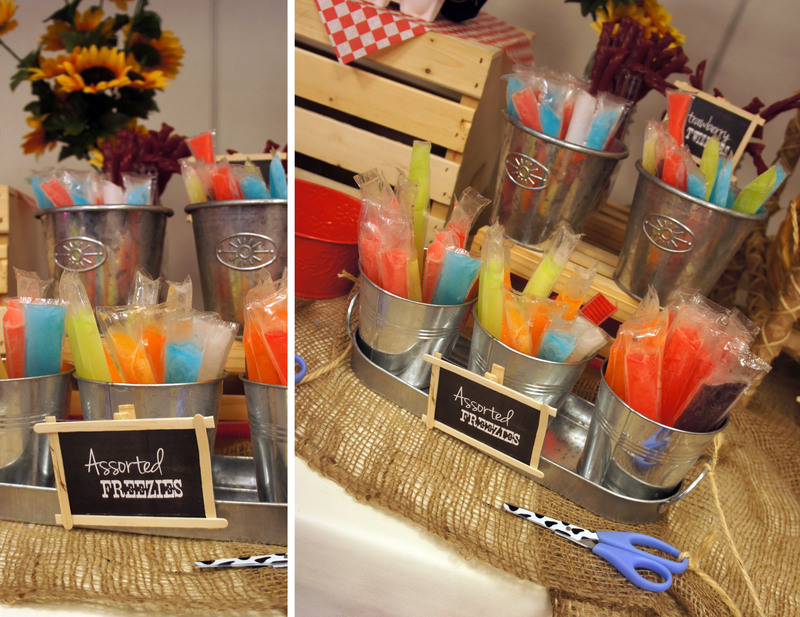 I decided to add small freezies onto my candy buffet as a cool treat for the kids and adults. I provided scissors to cut them open and people were free to take the sealed ones home with them if they so chose. As I’ve gathered the supplies and then slowly started buying the candy over the past couple months, my three year old has grown more and more excited. I am pretty sure he ate his weight in candy at the wedding and he has now been introduced to freezies. All the elements came together better then I could have expected and I am so happy with the final result. It was a fun project for me to tackle and I am glad I could use my creativity and skills to play a part in the Bride and Groom’s special day. Congratulations again to one of the sweetest couples I know! 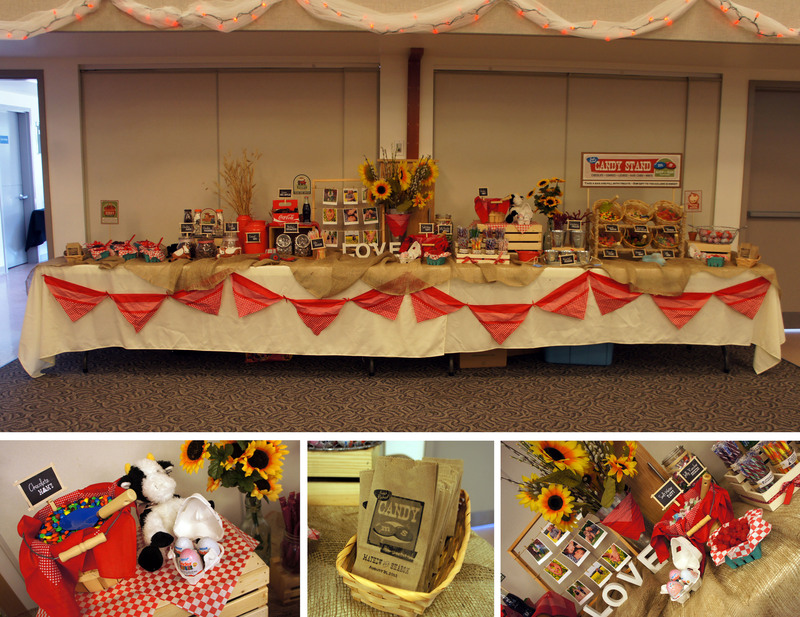 Next postFriday Favorites: Birthday Freebies!! Seriously, all the details turned out so amazing. Your creativity blows my mind every time. What an awesome wedding gift. Absolutely stunning! You did a fabulous job and you seriously impress me with your skills. It turned out AMAZING! 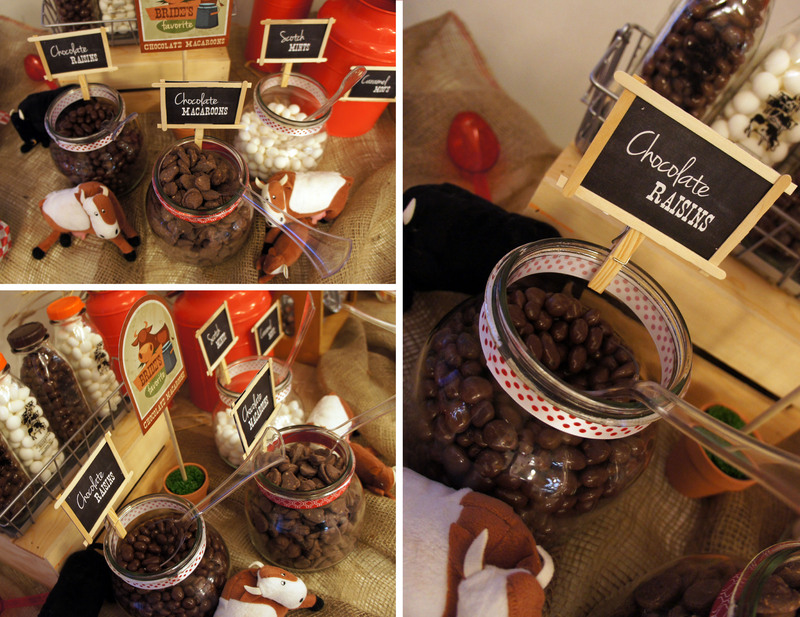 This was a huge hit at the wedding! I had no idea you’d done all of this yourself. It was amazing. It was absolutely stunning and the next time I need something like this you will be the first person I call!